We had leftover lobster from a banquet. Since I didn’t wanna use my hands to get the meat out during dinner time (becaues I have to concentrate on watching drama. :P), so I thought, “Oh, maybe I should get the meat out before meal.” The meat didn’t look that appealing after I took it out… I then thought, “Let’s use something to cover it!” So here it is! 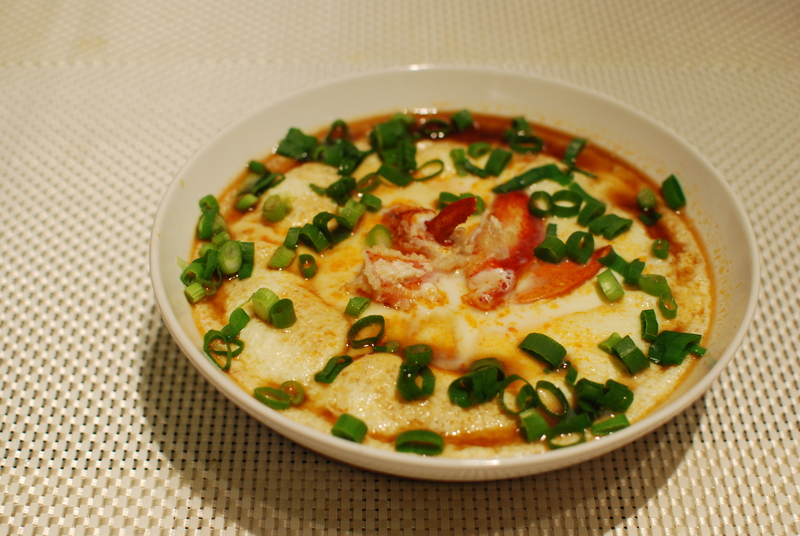 My steamed egg with lobster. The egg doesn’t look that smooth. I guess I turned the heat up too high. Oh well! Next time I’ll turn it to a lower heat and steam it for longer. I’m on holiday this week, so I have time to make something that requires some time. Since I had always wanted to make wonton, so I went to T&T to buy all the ingredients this morning. 1) Soak the dried mushrooms for a few hours, or until soft. 5) Cut the dried shitake mushroom into small pieces. 6) Put the pork, bak choi, shrimp paste, dried mushroom, egg (not shown in the pic), salt and white pepper in a big bowl. Then stir the mixture in one direction. 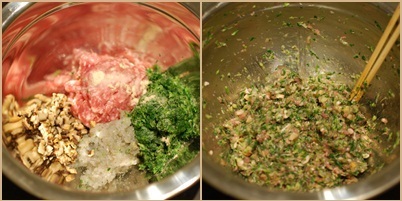 Mix until it becomes one paste… that means the mixture won’t fall apart. (I think it took me a few minutes) Then let it sit for 10 minutes. 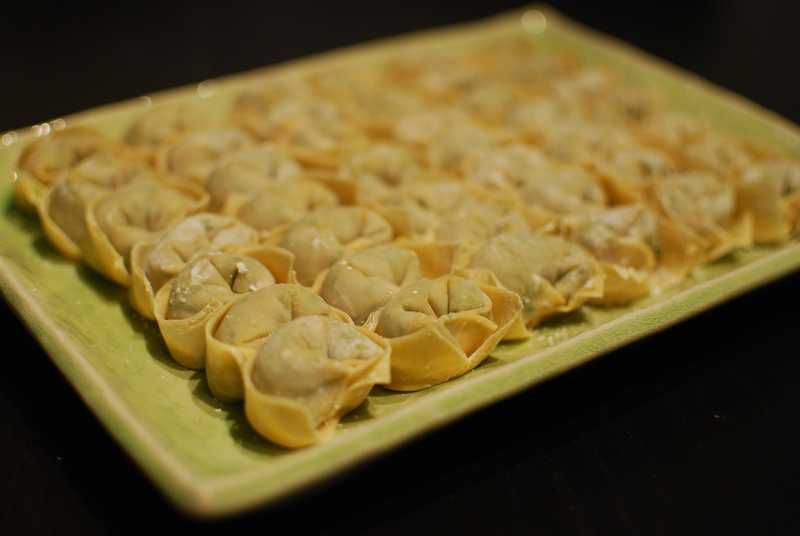 7.1) Put some mixture on the wonton wrap. 7.2) Fold the wonton wrap in half. If your wrap doesn’t stick together, use water to help “glue” the wrap together. 7.4) Then wrap it around so that the 2 ends meet. 8) Boil a big pot of water. 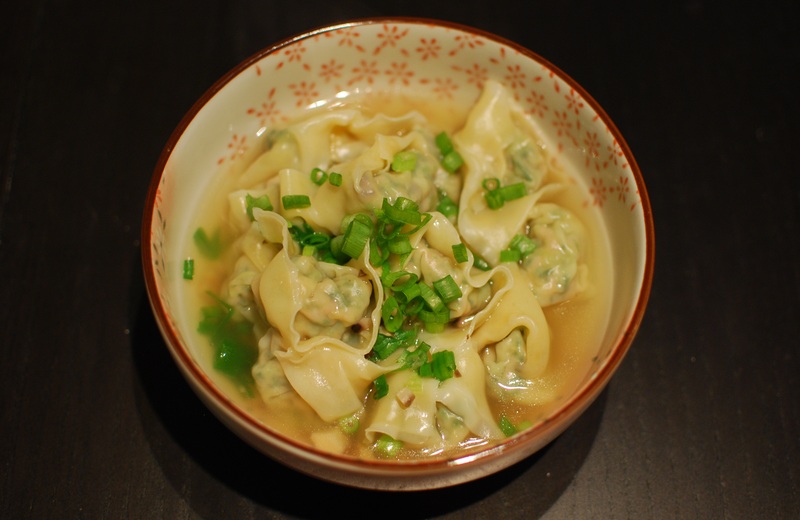 When water boils, put the wontons in. When the water boils, pour one cup of cold water in the big pot. 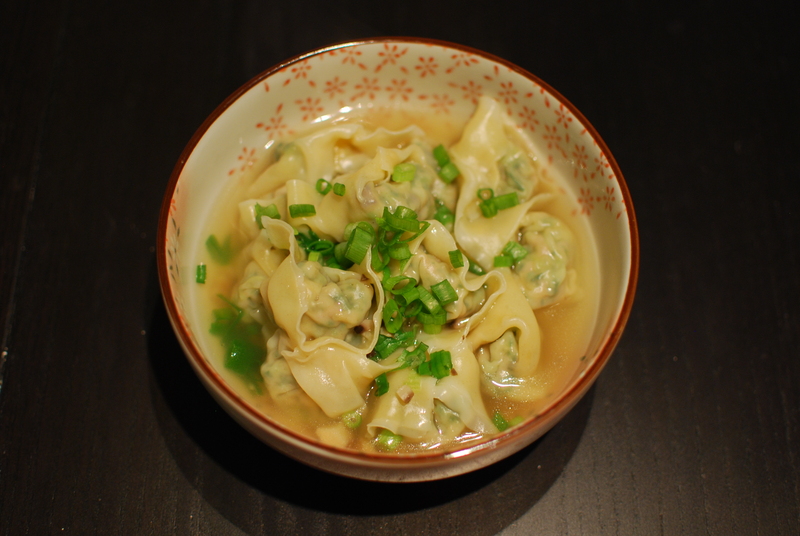 Now when the water boils again, and the wontons are floating, they’re ready to eat! 🙂 Put as much as you like in your bowl. 9) OK now… you can boil a can of chicken stock. If you like, you can add some ginger, garlic, shallots and whatever you like in the chicken stock; it brings out the flavour. 10) Pour the chicken stock into the bowl. Sprinkle the chopped green onions on top. 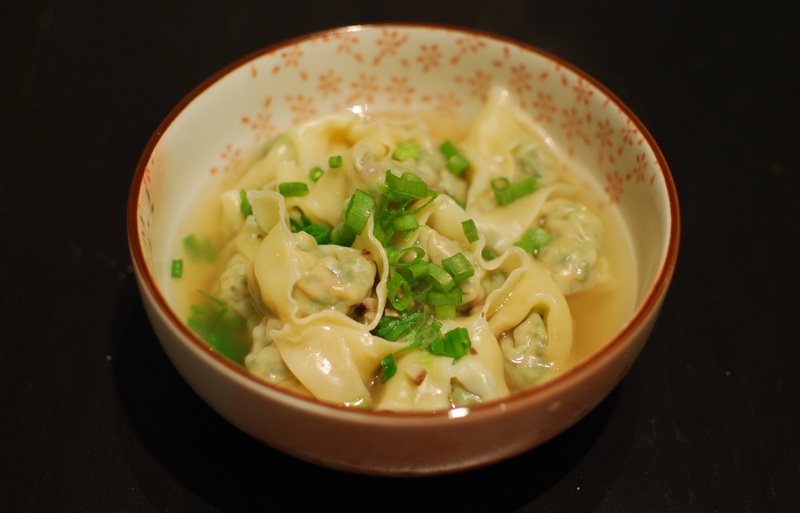 1) *I tried making wonton with ground lean or extra lean pork. It didn’t taste good at all – the meat was too dense. 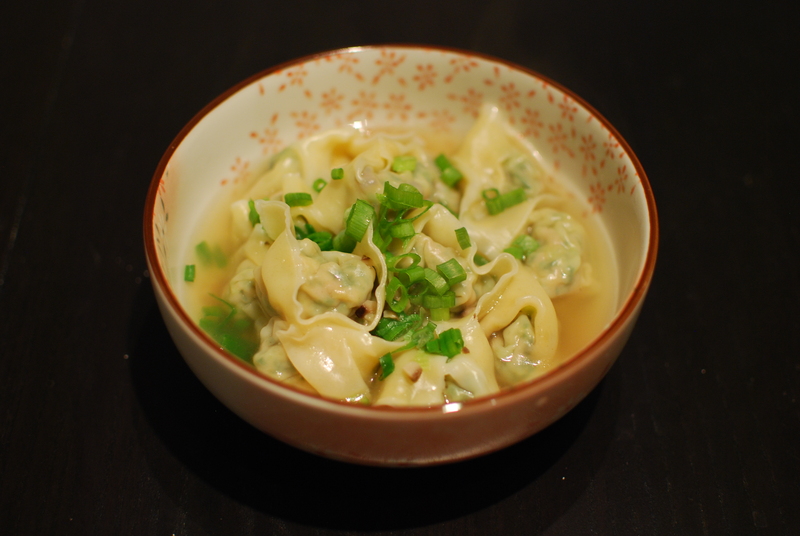 I’m not sure if it’s coz I don’t know how to make good wontons, or… lean and extra lean pork are not good for wontons. 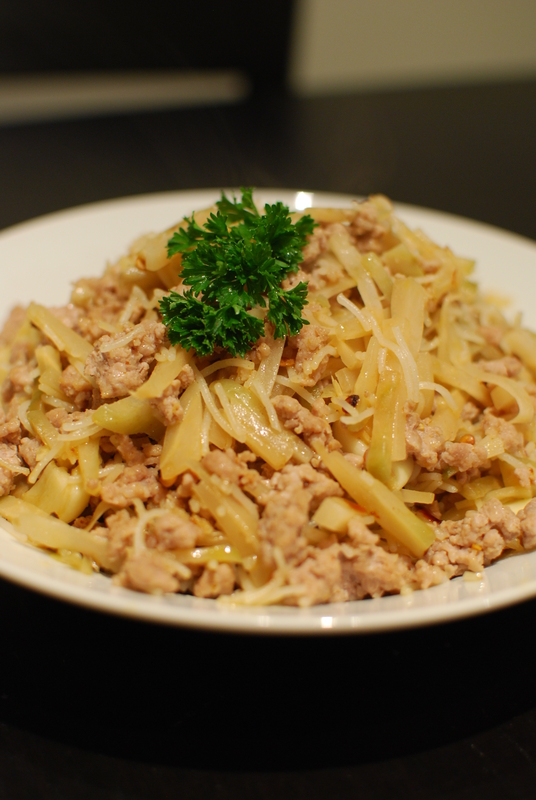 Anyways, I highly recommand using regular ground pork. That fat in the pork won’t make the meat so dense or firm. 1) Sprinkle salt onto chicken legs, and let it sit for 30 minutes. 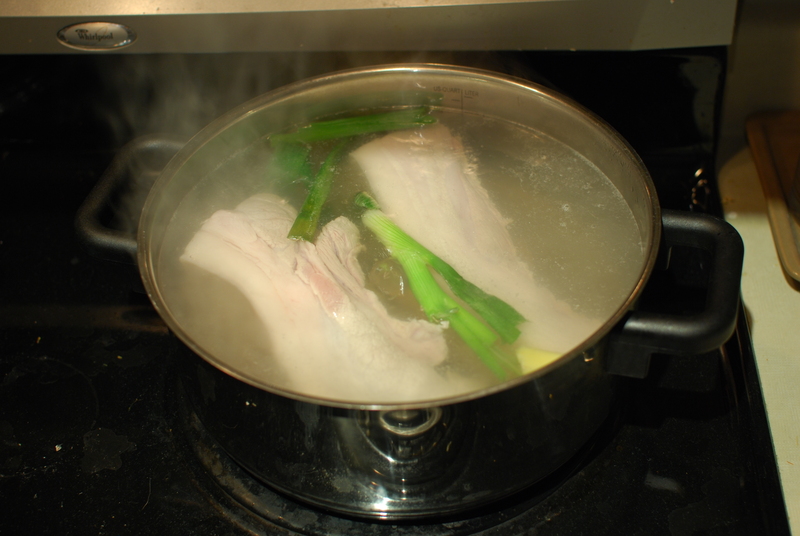 2) Boil a pot of water, and put the green onions, anise, szechuan pepper, pandan leaves, and ginger in the pot. Then put the chicken thighs in as well. Reduce to low heat and simmer until cooked. Do not drain the chicken stock! 3) Immediately put the chicken legs in ice cold water and let it soak until chicken legs are cool. 4) Debone, cut and serve. 2) Heat up a frying pan. Put some oil and minced garlic in, and stir fry for a bit. Be careful not too overcook the garlic as they’ll turn bitter. 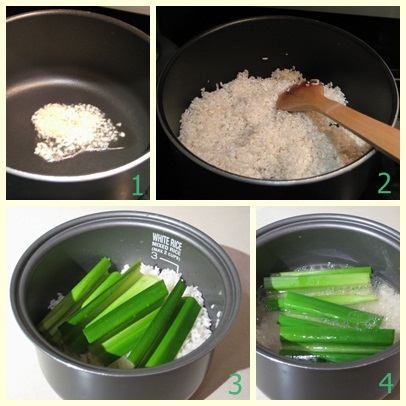 3) Put the washed rice in the frying pan and mix well with the garlic. Stir fry for 5-10 minutes. 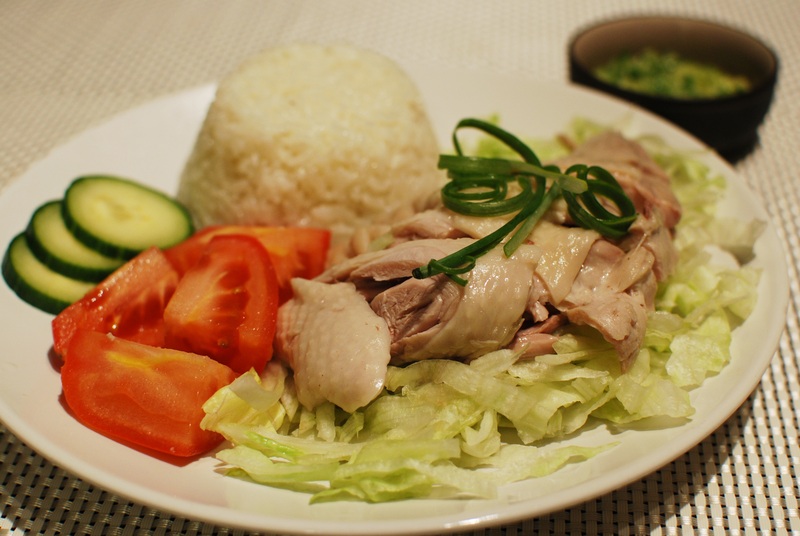 a) Put the chicken stock and pandan leaves in the frying pan, cover and simmer the rice until cooked. 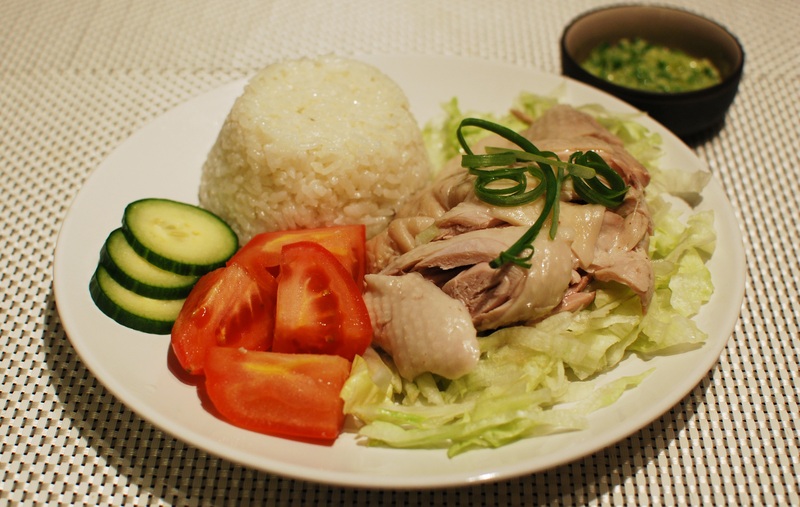 b) Transfer the fried rice into a rice cooker, put the chicken stock and pandan leaves in. Cook until the rice is ready. Just use the same amount of chicken stock as you would with water. 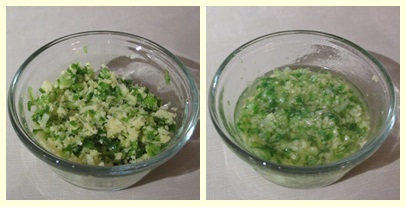 1) Put the chopped ginger and chopped green onion into a small bowl, add salt and ginger powder, mix well. 2) Heat up the oil. When the oil is hot, pour it onto the mixture to “cook” the green onion and ginger. 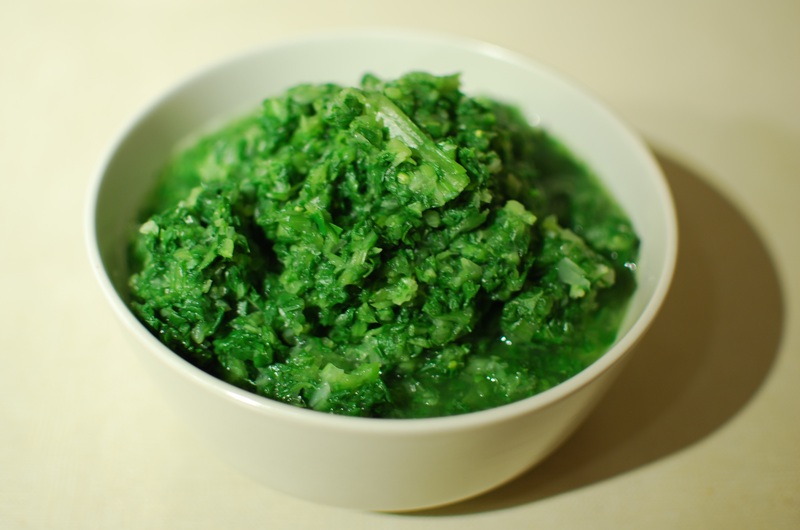 1) I only made the ginger and green onion sauce thist time… and totally forgot about the chilli sauce, just because I didn’t have lime at home… >.< I would definitely make the chilli sauce next time. 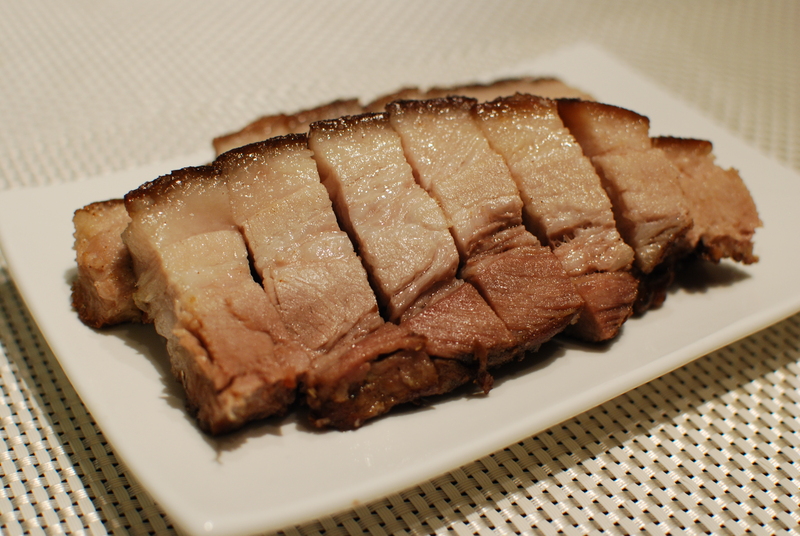 Lately I’ve seen a few people writing about making this Chinese style roasted pork on their blogs, and it doesn’t sound that hard to make (just takes time). 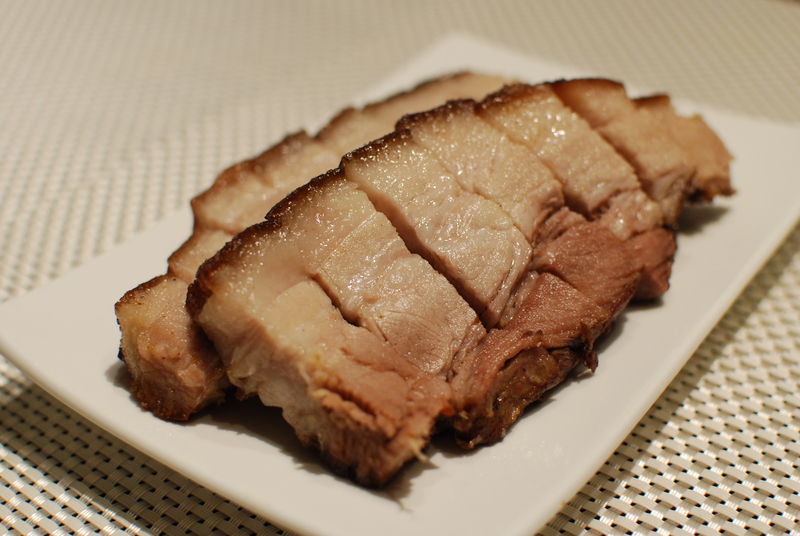 Since it’s long weekend here in Vancouver, which means I have time, so I decided to take a challenge – to make Chinese style roasted pork. 2) After boiling, take the pork belly out and let it cool. When it’s cool enough to touch, use a fork (or a few forks together) to poke LOTS of holes on the pork skin. You only have to it to the pork skin, not the meat side. 3) Rub the rose wine onto the meat (not the skin). 4) Mix salt, sugar and five spice powder together. Then use your hands to pat the spices evenly onto the pork belly, including the skin. 5) Let it air dry on a rack overnight. (If you don’t have time, let it dry for at least 4 hours). 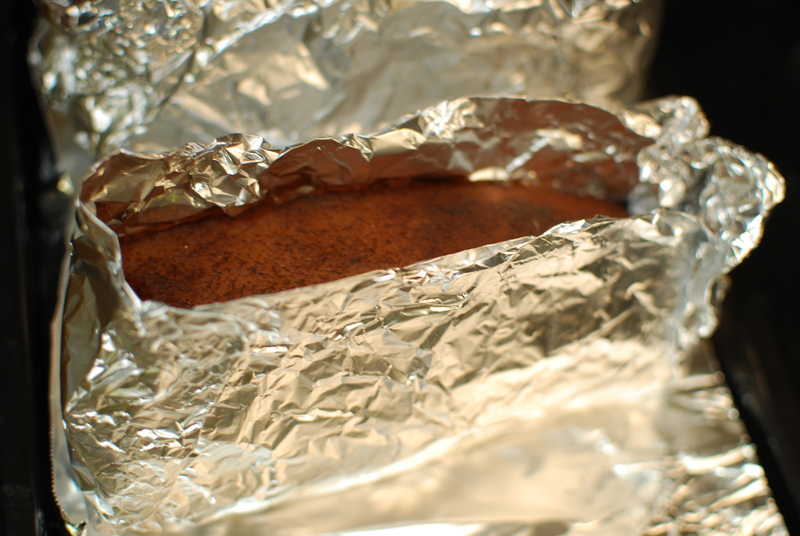 6) Use tin foil to tightly wrap the pork belly, leaving the skin uncovered. Leave about an inch above the skin. 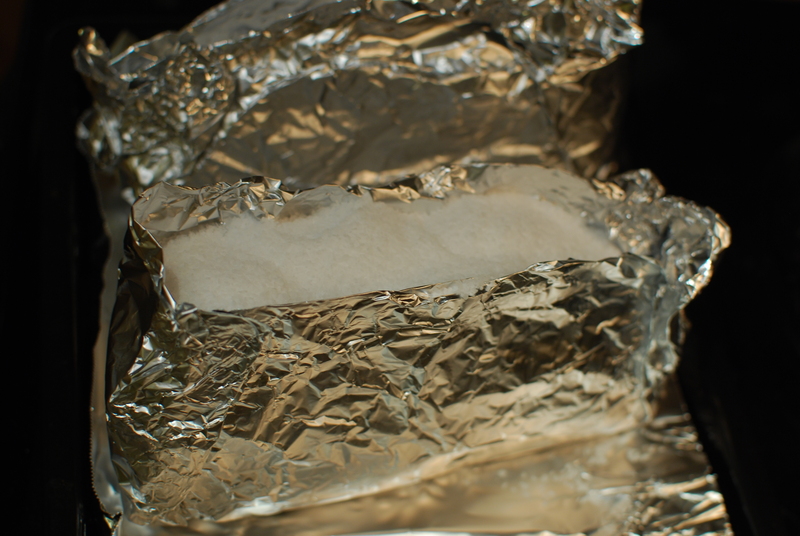 7) Slowly (and carefully) pour coarse salt onto the pork skin, cover it for about an inch, and then gently press it. Be careful not to let the salt go to the sides and touch the meat. 8) Preheat the oven to 430F. Then put the pork belly in and bake for 50 minutes. 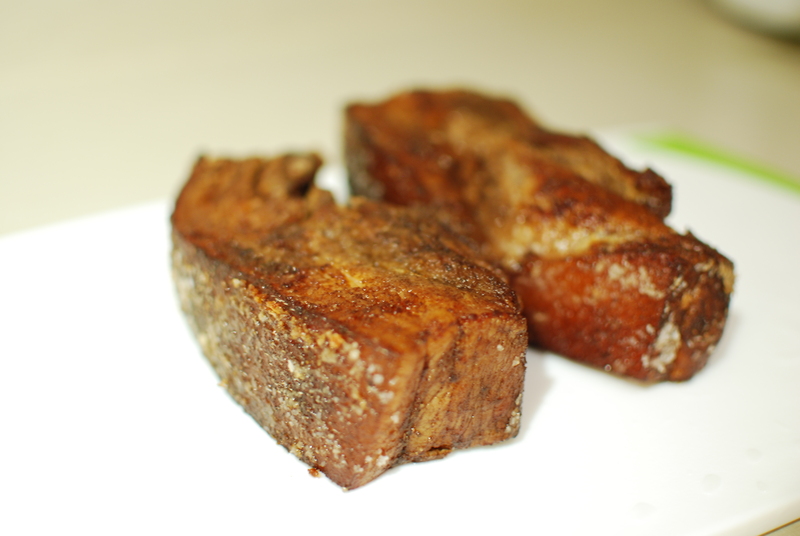 After the 50 minutes, take the pork belly out, and take away the salt. 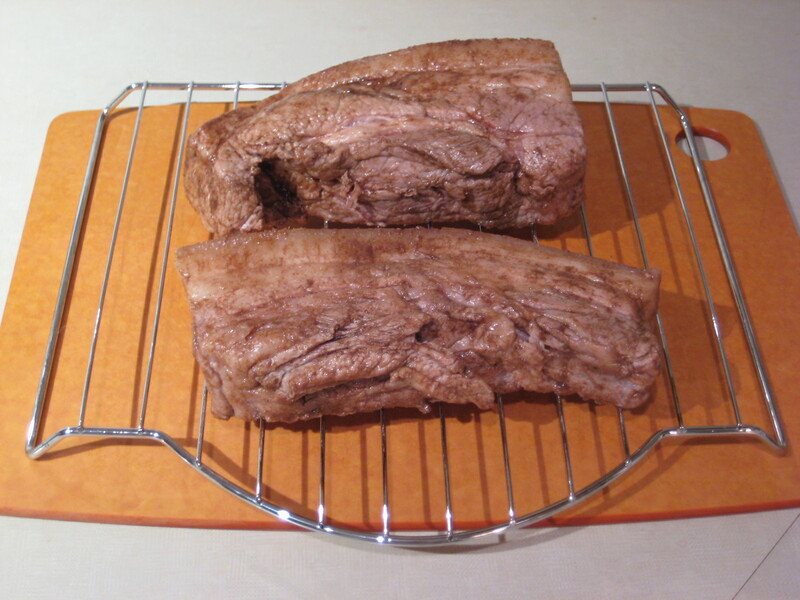 9) Reduce heat to 410F, and then bake (or broil) it for another 20-30 minutes, or until the skin is crunchy. 1) Ok, do NOT use brown sugar. It makes the meat of the pork belly looks so brown… which is not pretty. I’ve already restocked white sugar! So I’ll definitely use white sugar next time. 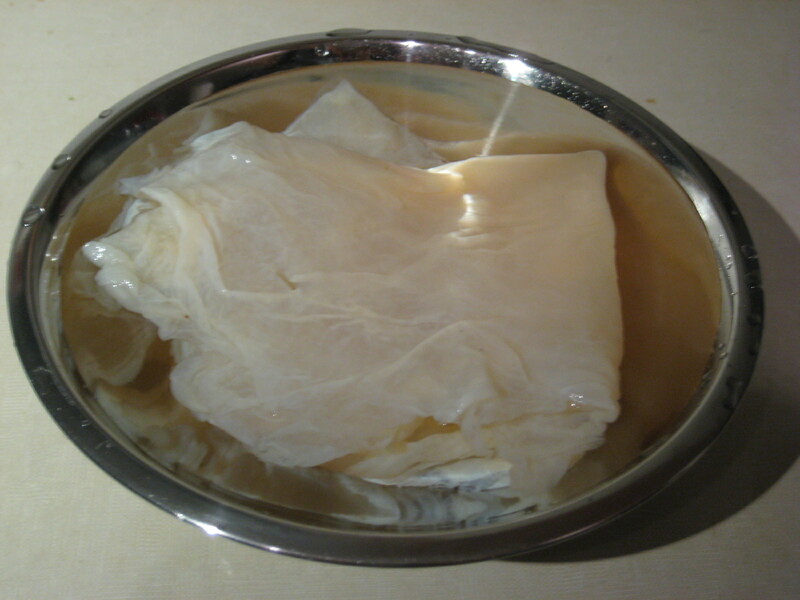 4) I read that the reason to put the salt on top of the pork skin is to draw the water out, so that the skin will become crunchy… not sure if it’s true though. I have always liked jellyfish when I was young (Yeah I know some of you think that eating jellyfish is pretty gross… but you just have to try it!!!). 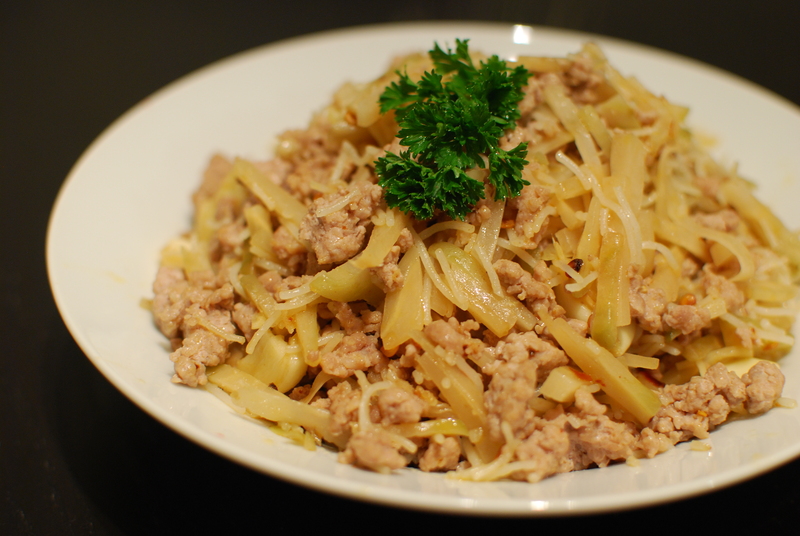 I never knew that you can actually make it at home… until I read a recipe book recently. I decided to give it a try, and if I succeed, then definitely I’ll make it more often. So here I am, trying this new dish. I modified the original recipe a little. 2) Steam the chicken until cooked. Then let the chicken legs sit until cool. Shred into thin slices. 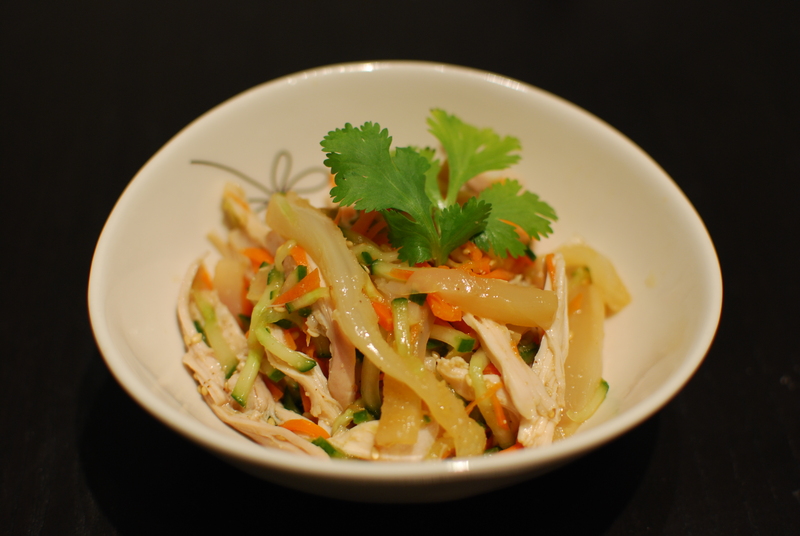 3) If you have time, put the chicken in the fridge before you mix with other ingredients. 1) Soak the jellyfish overnight to get rid of the saltiness. 2) Rinse it before you’re about to cook the jellyfish. 3) Boil water in a pot. When water bubbles, put the jellyfish in the pot. When the water bubbles again, take the jellyfish out, and put it in ice cold water. Let it sit for about 10 minutes. 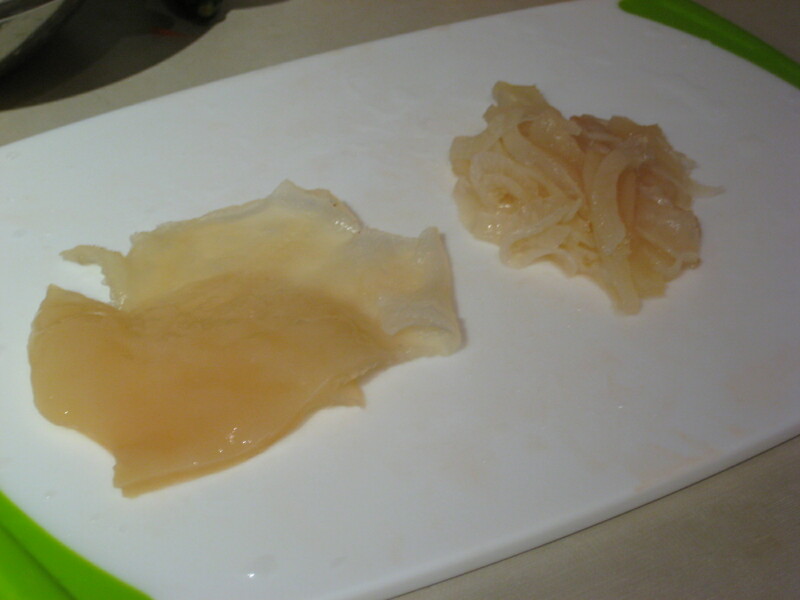 5) Mix a bit of fish sauce and sesame oil to the jellyfish. 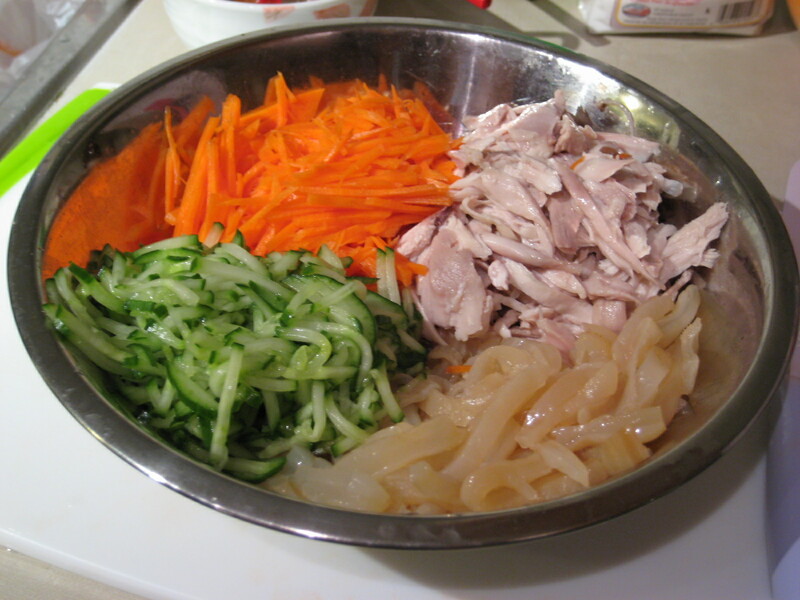 1) Put the carrots, cucumber, jellyfish and chicken into a big bowl. 2) Mix all the sauce ingredients together. Pour the sauce in the bowl, and mix well. 3) Put the dish in the fridge and let it sit for an hour or so. Serve. 1) I was very happy that I could make the jellyfish! My mom has warned me not to boil the jellyfish for too long, as it would make the jellyfish too chewy. So remember not to boil the jellyfish for too long! 2) Rememebr to rinse and soak the jellyfish for at least a few hours! They’re usually very salty, so you need to rinse the jellyfish a few times and soak it. That way the saltiness will come out. Few weeks ago, my co-worker brought an thousand year egg to office, and said that she’ll have that and tofu for lunch. I was like, “REALLY? 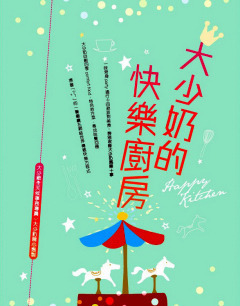 I have always heard about it but never tried it!” At lunch time, she cracked the thousand year egg, sliced it, and put it on top of the tofu. She poured some soy sauce on top… and TaDa! 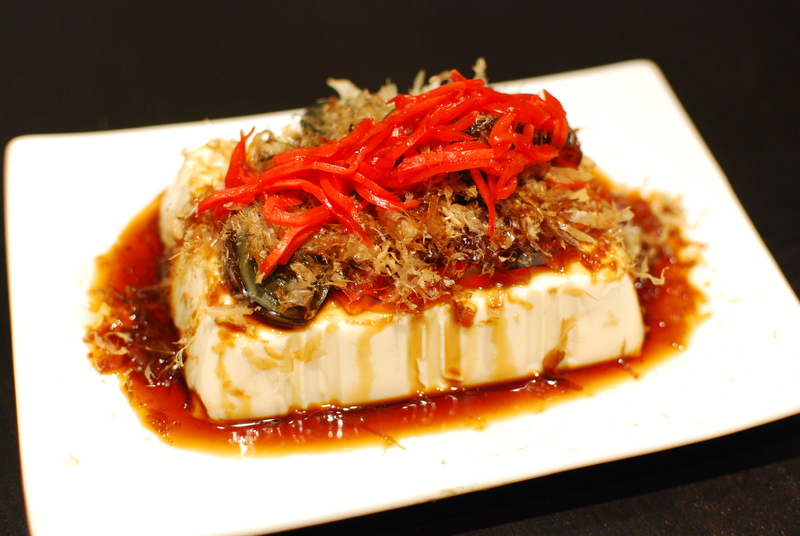 There’s a dish of Tofu with Thousand Year Egg. The whole process took like maybe… 2 minutes? It was so simple, yet it tasted so good. So tonight, I decided to give it a try, and make my own version of it. 1) Take the tofu out from the package, put it on a plate. Steam it if you like, or you can serve it cold. 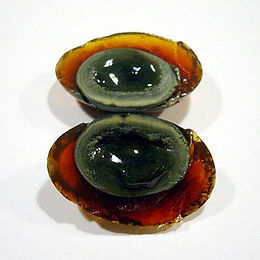 2) Crack the thousand year egg, peel it, and slice it. Put it on top of the tofu. 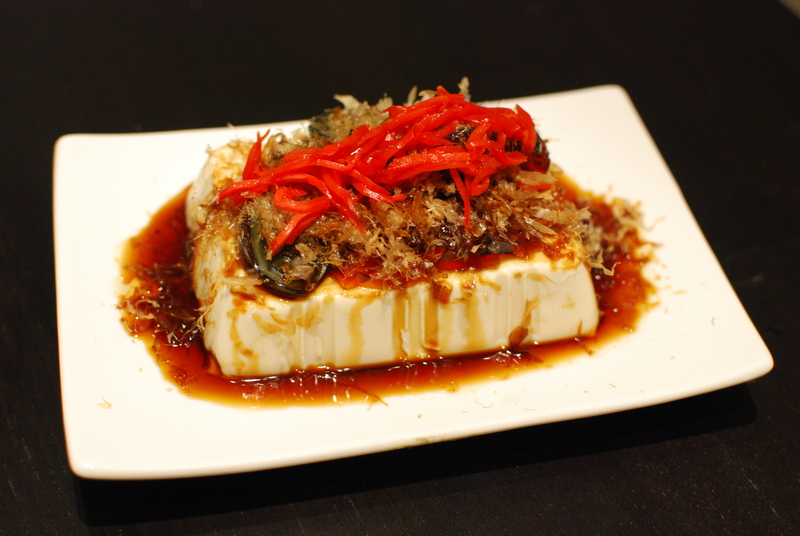 3) Put as much bonito flakes as you like on top of the tofu and thousand year egg. 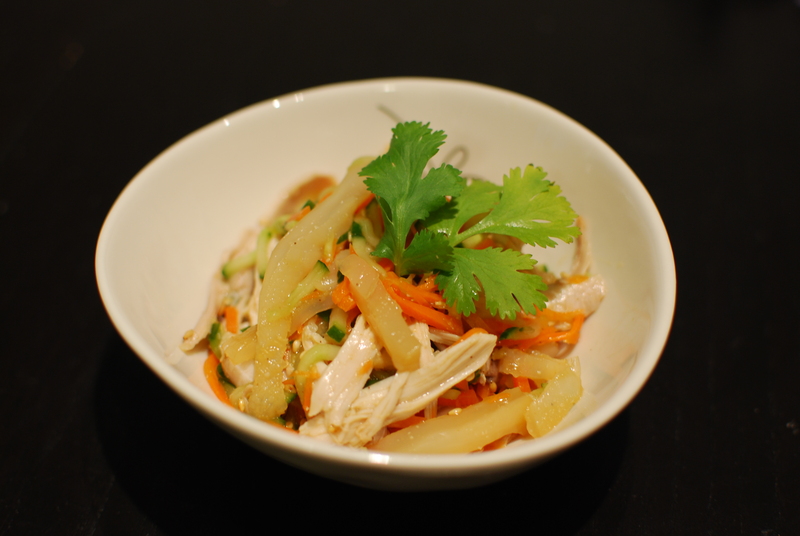 4) Put some sliced red ginger on top of the bonito flakes. 5) Pour soy sauce on top, then sesame oil. DONE! 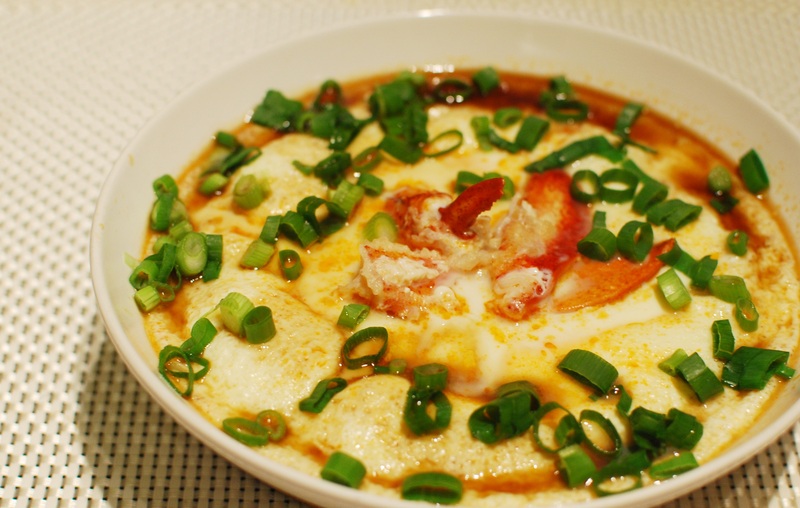 You don’t need to cook the egg. When you crack it open, it looks like a hard boiled egg, except that it’s black. And if you’re lucky enough to get good eggs, the yolk would still be quite liquidy, like a soft boiled egg, as shown in the above picture. OH btw, thousand year eggs are made with duck eggs, not chicken eggs.